Fantastic Beasts and Where to Find J.K. Rowling's Imagination - ReDVDit! One thing everyone can be sure of is J.K. Rowling’s ability to tell a story. Despite what criticism you may have about the movie itself, in regards to the filmmaking, the acting, the pacing, and the rest, it is undeniable that feeling you get when she opens up a new door, and invites you into her world. There is also no denying that power that the Harry Potter universe has on fans, and therefore it was not a surprise that this was going to be a big hit. And although there were many nods to the wizarding universe we have come to love, the story was nevertheless something beautifully original. J.K. Rowling is not only creating a cinematic or literary universe, but a new and growing mythology to rival the Ancient Greeks, Romans and King Arthurs. Newt Scamander’s briefcase is J.K.’s imagination. Although it seems ordinary on the outside, something we have seen before (stories of witches and wizards), when you look inside there is a bottomless and expanding new world of possibilities and creatures you have never heard of. The movie itself was impressive on certain levels. 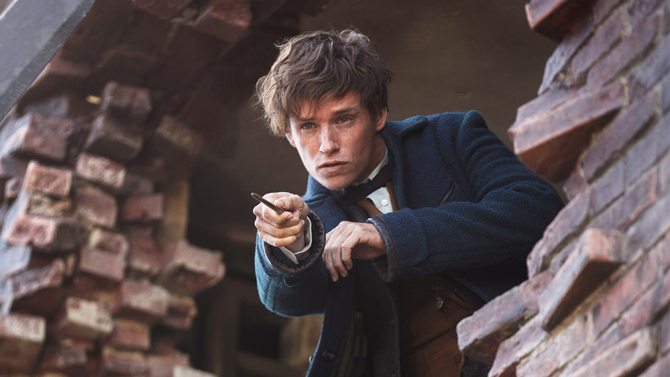 Eddie Redmayne was born to play a shy wizard clearly out of his element and David Yates has proven yet again that he can blend dark, evocative storytelling, and whimsical child-like fantasy to almost perfection. And although the movie suffers from the current craze of starting franchises before they are a franchise, Fantastic Beasts still manages to tell a unique and contained story, leaving a bit of room for expansion, but not heavily relying on “setting up a sequel”. The inevitable but heavy reliance on CGI for the creatures, and unfortunately not the best work we have seen out of Hollywood lately, sadly snaps you out of the fantasy. The fact the story takes place in the 1920s makes it harder to believe these very obviously fake and cartoonish fantastic beasts, especially when the 1920s set design, costumes, makeup, and music are on point. With a planned 5-film storyline from the pen of the Queen herself, we can forgive any minor infractions, and excitedly look forward to the future of this new franchise. If it will reach the fanatic heights of Harry Potter remains to be seen. Telly Vlachakis, born and raised in Montreal, Canada, is a film lover, art lover, collector, writer and researcher. Currently working as a writer for WatchMojo.com, he may have a slight obsession towards horror films, the Criterion Collection and anything to come out of a projector.